Top-quality deck and pole barn construction in Bowling Green and the surrounding areas. When you’re getting exterior remodeling work done to your residential or commercial property, you want quality construction that not only lasts, but looks good. At Onyx Home Improvement, we seek to do exactly that. On top of that, another reason our customers choose us is we’re experienced in all sorts of outdoor home improvement. One of the more unique services we offer is building decks and pole barns for our clients. If you’re looking for a new deck or pole barn, give us a call or fill out the form above to get the process started. If you’re a first time customer, make sure you ask about our special offers. Not sure you have the cash on hand? No problem! We can even help you secure adequate financing for your new deck or pole barn. Don’t put off your exterior modeling project any longer — get a fast and free estimate today. What Makes Onyx Home Improvement Your Top Choice for Decks and Pole Barns? At Onyx Home Remodeling we wanted to provide comprehensive exterior remodeling services to Bowling Green and the surrounding communities. In order to do that, we’ve added decks and pole barns to our repertoire. Just imagine…it’s the Fourth of July, you’re surrounded by friends and family — or business associates — and you’re holding a perfectly-cooked burger. You can feel the sun on your face, the wind at your back, and it’s all happening as you gather on a brand new deck. If you’re in need of a deck for your home or business, we’ll go over the details of your project to determine the design you have in mind, the materials, and how it will all fit together into the physical space you have. Imagine you need a structure for your property that has the strength to last through the years and the versatility to be used for your farming, storage, or equestrian needs. Whether your building needs are professional or recreational, you need a company you can count on. Onyx Home Improvement offers a wide variety of exterior remodeling services, including new decks and pole barn construction. When it comes to pole barns, they can be constructed quickly, last for years on end, and provide you with enormous versatility. 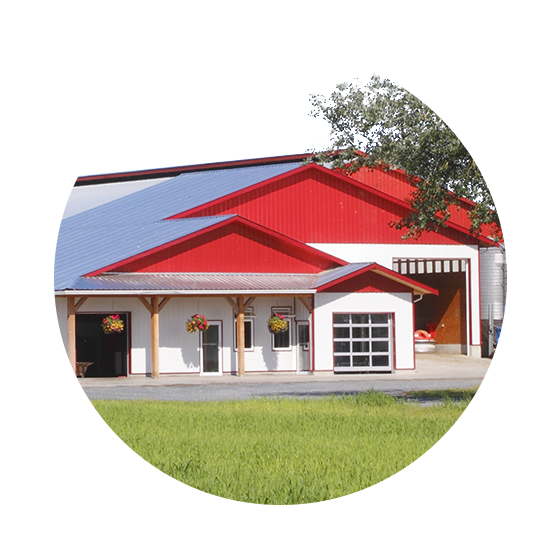 Whether your project is designed to be a horse barn, a vehicle shelter, or a farming structure, our team brings more than five years of experience and a keen eye for detail to every project. When it comes to deck and pole barn construction in Bowling Green, Onyx Home Improvement can’t be beat. To learn more about how we can help with this or any other exterior remodeling project, contact us online or by phone today.